Side 1 printed with 1 embossed area and 2 foil stamped areas on uncoated 100lb White Linen stock. 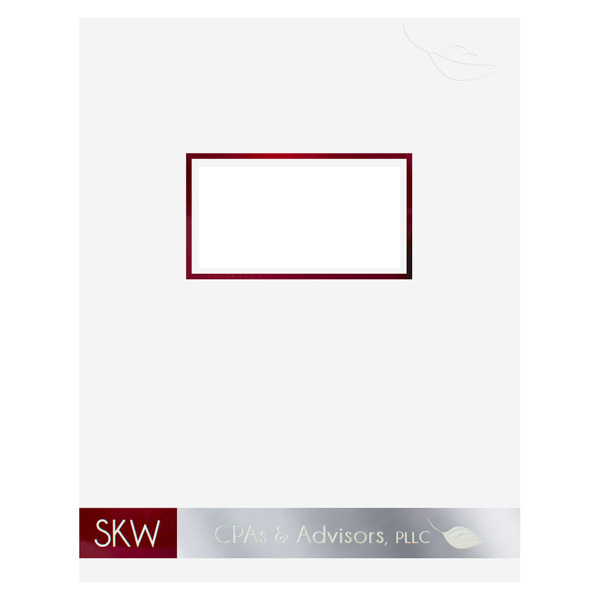 SKW CPA & Advisors chose a crisp, clean design for their tax return covers. Foil stamps in Metallic Cranberry and Metallic Platinum serve as the background for the firm's name and logo across the bottom of the cover. The foil stamps add a smooth texture to the White Linen stock, as well as a luxurious luster. An embossed leaf logo in the top right corner matches the leaf on the bottom. The logo is calming, as it reminds people of nature. Four-color process printed on both sides of uncoated 80lb White Smooth stock. Both covers sport a large pattern of dots—gray on the front, dark blue on the back. On closer inspection, this diamond-shape is actually a monochromatic replica of the OBM Associates logo's symbol. This way, the two pieces of the report cover are a mirror reflection of each other. The window breaks up the cover pattern, as its square corners' crisp edges contrast the round dots. The clean white cover implies honesty and precise calculations when handling clients' finances. 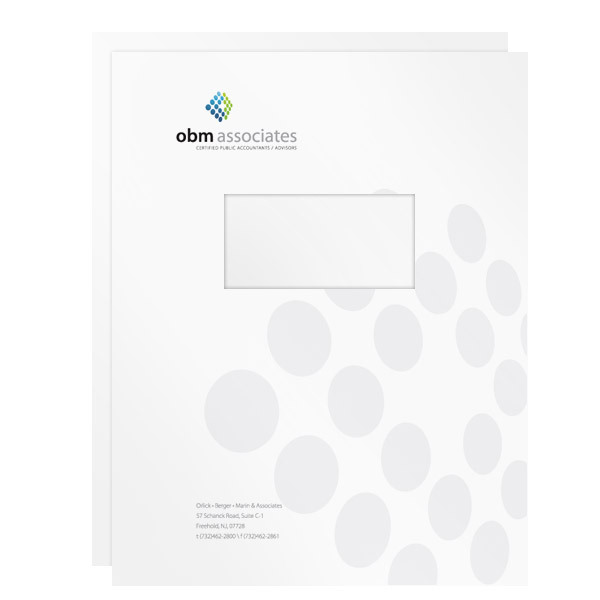 A blue back cover adds a splash of color with one of the shades found in the full OBM logo on the front. Side 1 printed with 2 PMS colors using heavy coverage on 12pt C1S White Semi-Gloss stock coated with Aqueous Gloss. 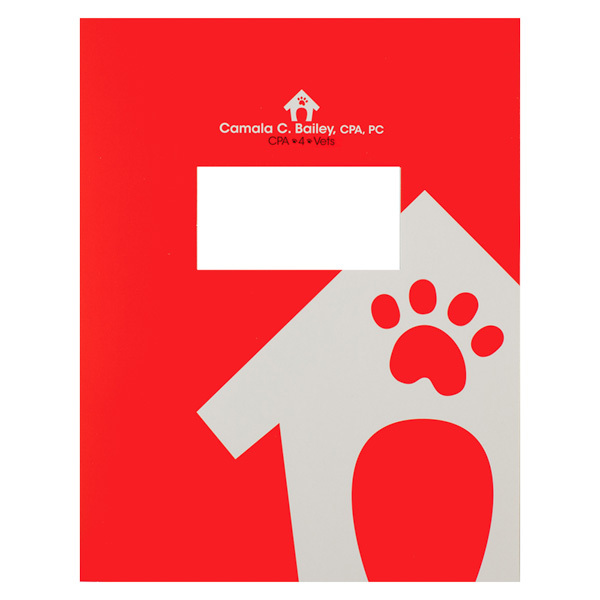 This bold red report cover helps Camala C. Bailey's clients stay organized. Her logo, a dog house with a paw print window, is prominently featured on the cover above her name. Tiny paw prints fit in the spaces between the words of her tagline "CPA 4 Vets." Side 1 printed with 1 embossed area and 2 PMS colors using light coverage on uncoated 80lb Pumics Felt stock. 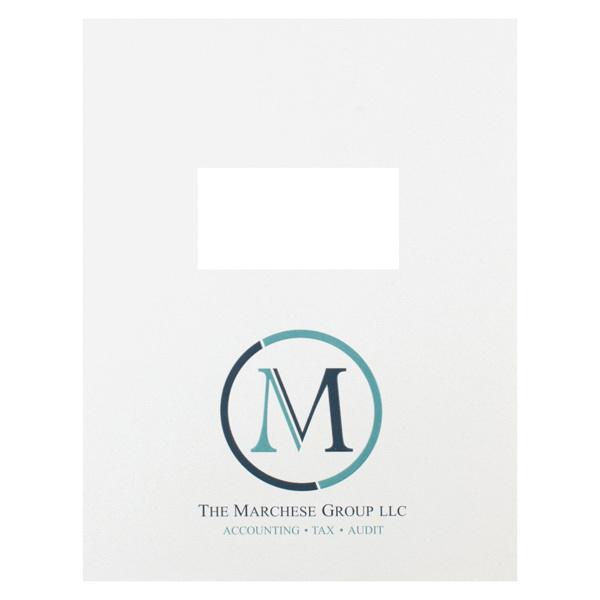 This design shows the Marchese Group is a one stop shop for clients' financial needs. Its logo, a capital M inside a circle, represents the close relationship the firm forms with its clients. A serif font indicates the firm is reliable and respected. Designed with versatility in mind, this two-piece product comes with a customizable carrying capacity for 8 1/2" x 11" contracts, tax returns, and reports. Bind or staple documents to the covers to hold them in place, without the risk of shifting or tearing. A 4" x 2" die-cut window optimizes the cover space and makes the design reusable. Simply place a custom title page behind the window for one project, then create a new title page when you need to deliver different documents. Dimension Closed: 8 3/4" x 11 1/4"